As part of our year rate payment, our local Council also runs its yearly hard rubbish collection. This annual ritual (which is bi-annual for some suburbs) sets a range of household activities linked to better garage organisation. A few weeks prior to the annual collection, households receive a reminder that it is approaching and then week after week, surrounding suburbs begin to place their hard rubbish out for collection. Whilst hard rubbish collection is not just about your garage and garage organisation, it seems to set off a string of spring cleaning activities within my household. Most of these activities have to do with inside the home but we eventually also end up outside in the garage, re-organising, cleaning up, and throwing out. Garage shelves are emptied, tubs are opened, benches are cleared so that we can see exactly what we have stored since the previous clearance and what we no longer need nor want. As the family grows up its a lot easier to determine what needs to be kept for the kids. Certain furniture and toys are just no longer needed and better off with others. Seeing it all once again makes it easy to simply remove it and place it out for collection. Much of our garage storage is made up of garage racks and shelves. They work a treat by holding lots and allowing lots to be buried away (out of site and mind). This is a problem in itself however. When you store tools and work related equipment on shelves, seeing what you have and finding it becomes really difficult. It uses up precious time and generates frustration. 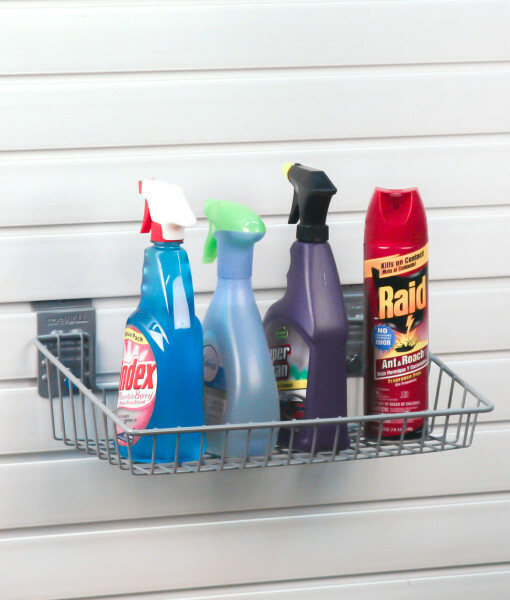 Having your tools hanging or stored via a slatwall rack can be a lot more practical. Slatwall panels are a wall panel with grooves that allow accessories to securely hook into them. You can then use the accessories to hang and store your equipment on. What I like about slatwall panels is that they allow your tools to stay visible and most importantly accessible. This is unlike a racking or deep shelving system. Hard rubbish collection in my neighbourhood isn’t until August but I have already begun to review what can and can’t go this year. To help you with the garage reorganisation part of your clean up project, StoreWALL has launched its StoreWALL Starter Kit. 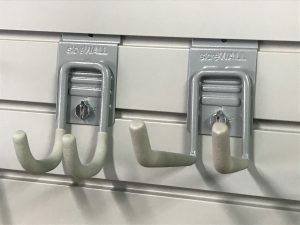 The idea behind the kit is to bundle a selection of accessories that inspire you to see what you can achieve with your garage as well as how StoreWALL can help you get organised. To help you get started, StoreWALL offers a simple bundle of accessories which can be added to your StoreWALL slatwall panels. You will obviously also need the slatwall panels and we make these available as single sheets as well as in packs of 6 or 4. The packs of 6 are 1.2m in length and the pack of 4 are 2.4m. When you are ready to get started with your next garage organisation project, give us a call so we can help you with ideas and pricing on how our garage solutions can solve your storage problems.